A young mother diagnosed with cancer talks about her new book, “Everything Happens for a Reason,” and the connection to her work on the prosperity gospel as a Duke Divinity School professor. The irony lay in the fact that Bowler, a Duke Divinity School professor, is a historian of the prosperity gospel, the quintessentially American belief that God rewards the right kind of faith -- and that if you are suffering, you must have done something wrong. So when she received this devastating diagnosis and, at the age of 35, did not know whether she would see her young son go to elementary school or would even live out the year, it prompted deep theological reflection on her part. Were her beliefs so different from those of the people she’d met at megachurch healing rallies? But I think the more pressing part was I noticed that the second I got sick, I was flooded with the same kinds of questions and hopes that I had just been watching other prosperity believers have for the last 10 years. So I started writing it less like a traditional book and more like a theological excavation. I had a writing process where I would write until I found the hardest, truest thing. Q: And what was the answer to that question? It’s kind of layered, I guess. Mostly that hope takes on different shapes. Sometimes it’s hope for yourself, and sometimes it’s hope for other people. Maybe, too, a different sense of time. Maybe you can, I don’t know, learn to settle into a different kind of present, where you’re alert and aware and grateful for what you have, as opposed to always being hungry for something else. I do also just think that being hungry is part of being alive. I think humans are just always a little bit starving for something. So I’m not sure I can totally ever get away from some of the deliciousness of the lies. But yeah -- hope, time, a sense of gratitude permeates everything for me. I try to really slow down my day and pay attention to the best part. Today, at 8:30 a.m., I could tell I was having the best part of my day. So I try to just take a minute and realize my kid just wants to sing “Down by the Bay” by Raffi on repeat for 45 minutes while eating toast. I used to skip stuff like that. Like when I took a trip, I would always think, “I’m going to go to New York a hundred more times in my life,” and now I never treat anything that way. It’s like, “Oh my gosh, I get to take this trip.” Or how being 4 seems hilarious -- like, when will he learn how to say the word “zebra” and not “zimbra”? People who have gone through stuff will never say that they’re fine. They just won’t. It’s because we can’t go back to a certain peace we used to have. I’m kind of in a managing-illness phase, but I’m very interested in what it’s like to actually live without certainty. That’s what I’d love to explore. Q: What has been the reaction to being public with your illness -- writing two pieces in the New York Times, and now the book and a podcast? I have been shocked by how often people feel like they have to rush in with an explanation for what I’m going through. It’s got to be my family. It’s got to be what I ate. It’s got to be some habit, or I deserve it in some way. The theological reasons just come out like gangbusters. That’s why I wrote the book, and it’s also kind of why I started a podcast. To talk to other people who are living with the burden of having a tragedy happen and then people trying to explain it to them. Q: Tell us about your podcast. So the podcast is partly me trying to have the sorts of conversations I wish people had had with me -- what happens when life isn’t so bright and shiny anymore. I talk to people like Nadia Bolz-Weber about what she learned from being a stand-up comic and from being in recovery about what it means to be present to people who are on the outside. I talk to Lucy Kalanithi, who is the widow from “When Breath Becomes Air,” about what love cost her and the kind of gratitude she has about living with and loving someone even who passes away too soon. I talk with Alexandra Petri, who is my favorite humor columnist. She has this great book called “A Field Guide to Awkward Silences” about how you just embrace the weirdness of other people’s unfixable lives. Part of the joy of doing this is I get to build a bridge to people with other kinds of dilemmas and issues to understand the universalizing experience of unsolved pain. Q: In the book, you point out the irony of being a scholar of the prosperity gospel. What do you think are the most important insights that your work gave you, and then your experience being ill gave you? Well, my time in the prosperity gospel taught me a lot about human longing. I think most people look at the prosperity gospel as just another instance of greed -- private jets and whatever, the classic televangelist weeping in front of the camera. But it’s mostly about answering our most basic desires. I don’t know why I didn’t see that before, but what we want is usually really basic. We want somebody who really thinks we’re beautiful and adores us, and we want kids that don’t hate us. We want the most elemental things. So when I got sick, I noticed the kind of double blessing and burden with the prosperity gospel. The blessing is it constantly offers you a sense of agency. When things are so terrible, you just want that little bit of traction to feel like this day is not entirely defined by a drug I can’t control, by a doctor I think I hate, by all the factors that you just have no control over. Q: One of the things I’ve noticed in speaking with you and in reading your book is a surprising amount of humor and a surprisingly minimal sense -- to the reader, anyway -- of anger. It does push you into this really weird place where it’s simultaneously incredibly funny and completely horrifying, because everything has a surreal quality to it. So you just kind of have to roll with it, or you’re just going to tear the IVs out of your own arms and, like, run out of the hospital screaming. There’s not a lot of choice. I am angry, though. Pretty profoundly angry at a number of things. Institutional evil is incredibly obvious when you’re sick. Hospitals are not created to nurture and protect your deep humanity. Insurance companies are run by evil robots. They’re definitely trying to murder you all the time. I have almost died a lot in the last two years, and I am pretty pissed about it. Because I have caught so many human errors that have cost me a great deal. I’m pretty angry, but that usually just makes me get to work. Q: Did you ever feel angry at God? Mostly because I thought that the gospel requires us to surrender everything, and when I really thought through what that meant, I thought it was actually impossible and unfair. The easy stuff? Fine. Smoking? Whatever. Not committing adultery? Great. But don’t ask me to give up my toddler. Only a monster would ask me that. Q: You talk about loss of privacy. But then you wrote a book about it. Oh no, writing is a super private experience. I know it seems public, but it’s actually crazy private. It’s like I wrote down everything I couldn’t say to other people. Because when you’re sick and so many people need you to be OK, you fall pretty easily into this pattern of behaving in a way that people need you to. Q: Trying to make them feel better? Yeah. It’s just so awful, and plus, you just need everything to work. You need someone to take care of your kid, and you need your nurse to not screw up your IV. You just kind of keep behaving. So writing was so private for me. It was one of the only places I’d dig and find that hard, horrible truth that was really hard to say out loud. I gained so much from living in that interior world for a while. If I had one hope for the book, it would be that people who are in pain feel like less of a loser. I felt pathetic so often, and there’s just so much stigma attached to suffering. So if that interiority can make people feel less absurd for their suffering, great -- it’s a win. Q: This is a mainstream book, but it’s very, very deeply Christian, deeply theological. It’s a super Jesusy book. Q: Did you have any struggle with that, either yourself or your publisher, as far as reaching the broader audience? I’ve been really grateful for how much that was accepted as a part of my package deal, because I just think theologically. Everybody is working through presuppositions of some kind, and I’m just making mine obvious. And my experience with the prosperity gospel taps into a wider religion that so many people share. Q: Are there other things that you hope your readers will take away? There are some practical things at the end of the book, like the do’s and don’ts. Like don’t be a monster. The basic thing is not all pain has to be explained. I wish people would just, like, take a breath, notice the person in front of them, and realize that it’s probably a hard day and maybe they just want to talk about “The Bachelor.” It’s a good season. Detail of book cover. 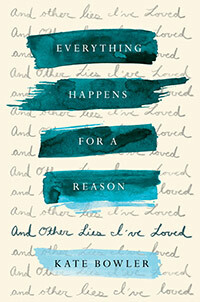 "Everythings Happens for a Reason: And Other Lives I've Loved"
Excerpt: "Everything Happens for a Reason: And Other Lies I've Loved"